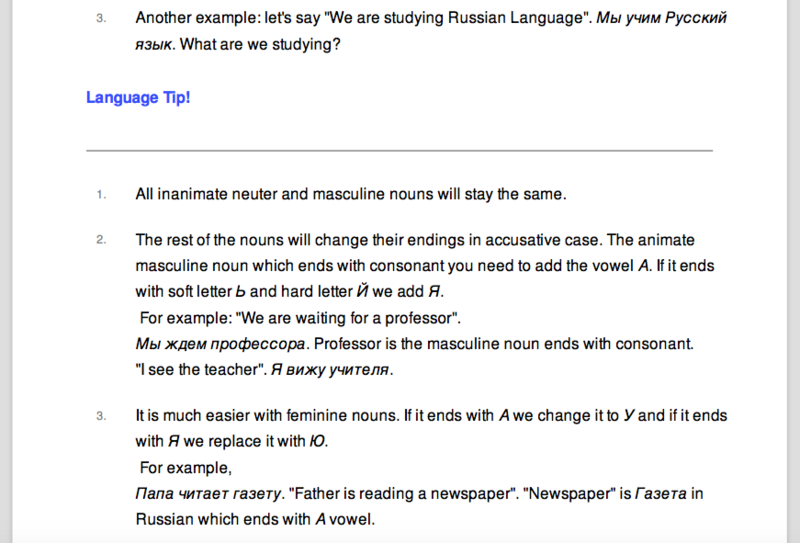 RussianPod101 is an online learning system for students of Russian. It has been designed to supplement textbook courses, particularly as a means of improving listening comprehension. The program is primarily made up of an enormous collection of professionally-produced audio and video lessons, each one presented by a native speaker. The clips and their accompanying transcripts and lesson notes are all completely downloadable, so you can practise whenever you want on any device. 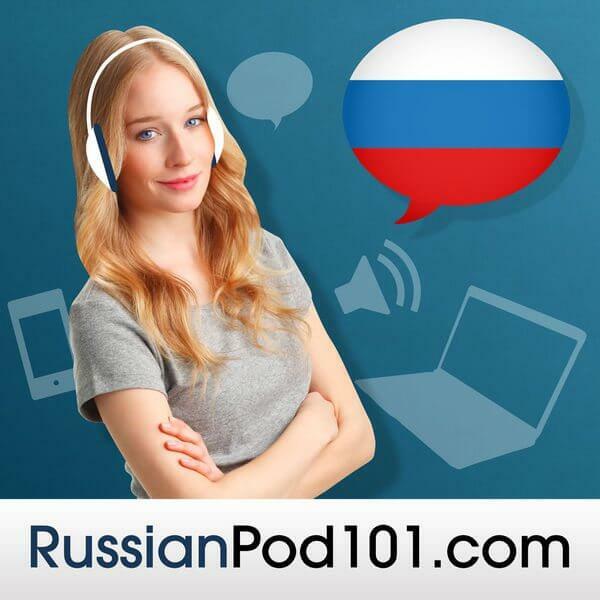 We believe that beginner and intermediate learners should consider getting RussianPod101. Although there are lessons for advanced learners, they are not as plentiful or as useful as the grammatical explanations and role-play videos that can be found in the lower levels of the website. 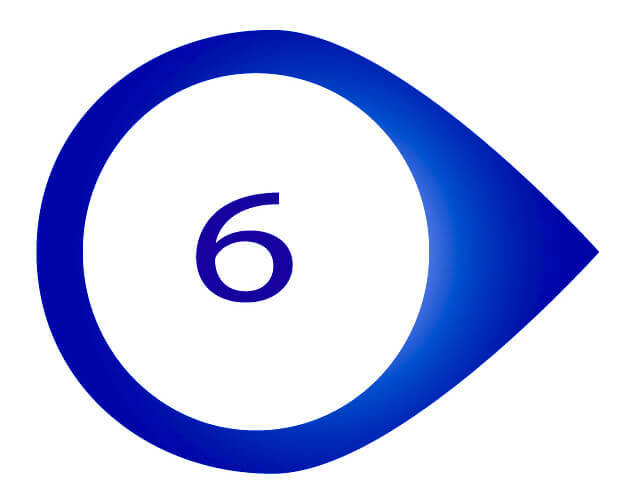 If you think that you are above B2 level in the CEFR scale, then we suggest that you have a look for other listening resources. But if you haven’t reached that level yet, RussianPod101 will almost certainly be of use to you. Read on to discover all of the tools and features that you get inside RussianPod101! The RussianPod101 dashboard can appear quite confusing at first. There are a large number of tools and materials on display, and you may not know where to begin. In actual fact, the website’s layout is very user-friendly once you get used to it, and each section is neatly organised for you to find your way around easily. 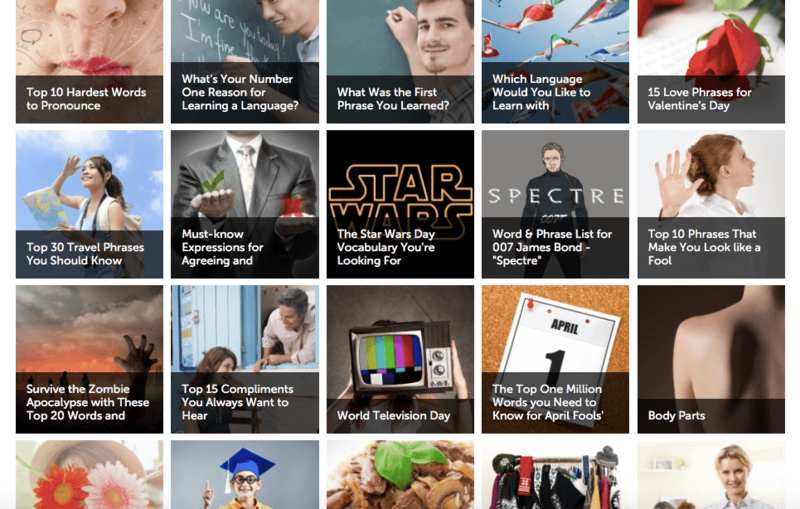 This is the core of RussianPod101’s learning program: several thousand podcast-style lessons covering an enormous range of topics – grammatical explanations, role-play dialogues, thematically-grouped vocabulary, pronunciation tips, and many more. 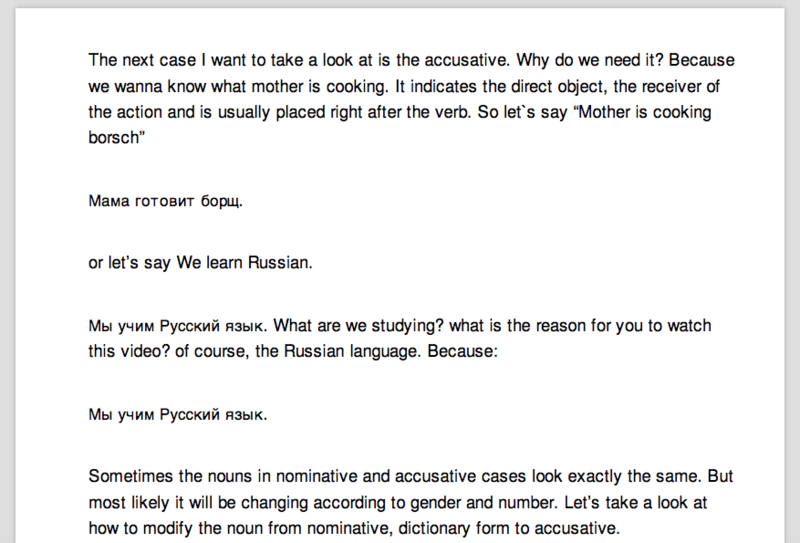 We really like that are lots of lessons that cover the cultural aspects of learning Russian – it’s no good just having a firm linguistic grasp of the language if you don’t understand anything about the people that speak it! 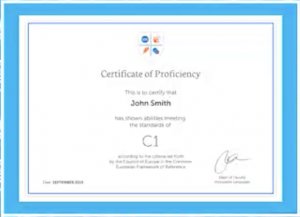 Choose your Level – This is self-explanatory, with each level roughly adhering to the CEFR scale (although the “Advanced” level is really closer to upper-intermediate difficulty). 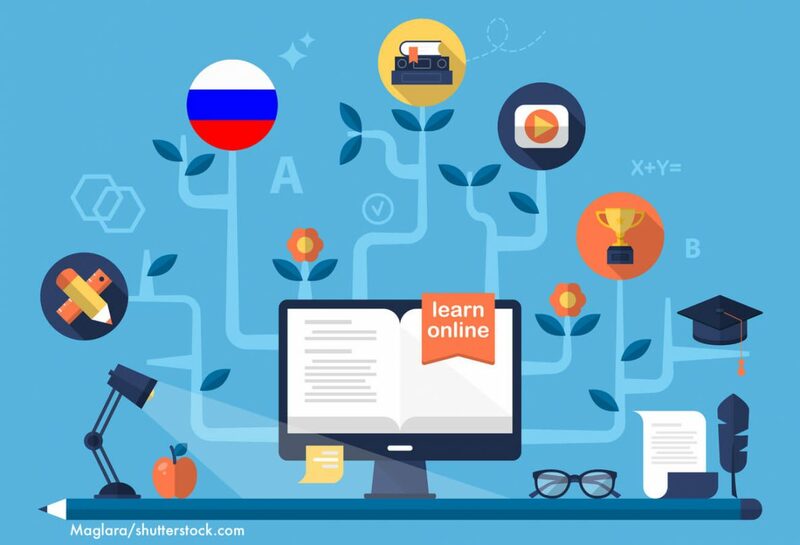 We like that there are plenty of lessons for intermediate students, as most online Russian courses tend to focus solely on beginner lessons. Choose the Pathway – Pathways are groups of similar lessons. Choose the lesson – At this point you can watch the video clip and then work through the accompanying written exercises, or you can download all of the material to go through at a more convenient time. The ability of tick-off each lesson in the checklist once you have mastered its content is useful for keeping track of your progress. What’s nice about this system is that you are able to jump about in between different pathways and different levels (perhaps your grammar stronger than your listening skills – in which case you would benefit from more advanced grammar lessons). Other products often force you down a linear learning path which can be frustrating as certain skills develop faster than others. Each lesson begins with an audio/video clip featuring a member of the RussianPod101 staff. Some of the clips are better than others, and, likewise, some of the presenters are more engaging than others. 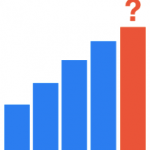 But the general quality and professionalism of the videos is very high – much higher than what you would get from your average YouTube channel. …and if you still find you’re missing important information read the full transcript which can be found towards the bottom of the page. By only using the assistance as and when you need it, you’re listening abilities will increase rapidly! You can also look at the summarised lesson notes. These are wonderfully concise and clear – you honestly won’t find better grammatical explanations in any of the textbooks on the market. Although they aren’t as prominently displayed on the website, you should spend as much time studying these notes as you do watching the video content. If you have any questions that the lesson content has not answered you can simply ask in the comments section. We found that a member of staff will usually get back to you within a few hours or so. Everything here can be downloaded onto your device for no extra fee! Some older reviews have criticised RussianPod101 for not dedicating enough of their content to grammar. This is a fair point – grammar is the skeleton of any language, and you really can’t say or understand anything without it. However, we can happily report that RussianPod101 has taken this feedback fully on board and has responded by creating sizeable Grammar Bank, as well as adding a number of grammar-dedicated lesson pathways. 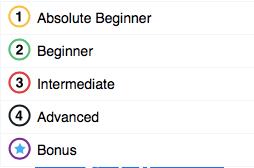 As you can see, there are a plenty of topics – in both Russian and English – to sink your teeth into (bearing in mind that the picture above only shows the grammar items for the “Absolute Beginner” level). if you have ever tried to learn a language before you will know how frustrating it can be to develop an uneven vocabulary bank. You can natter away on certain familiar subjects, but when something outside of your comfort zone comes up it can difficult even forming a coherent sentence. The solution to this is thematic vocabulary lists. Work your way through each section – even those that you think don’t really have much connection to your everyday life – and you’ll be able to talk on any subject. 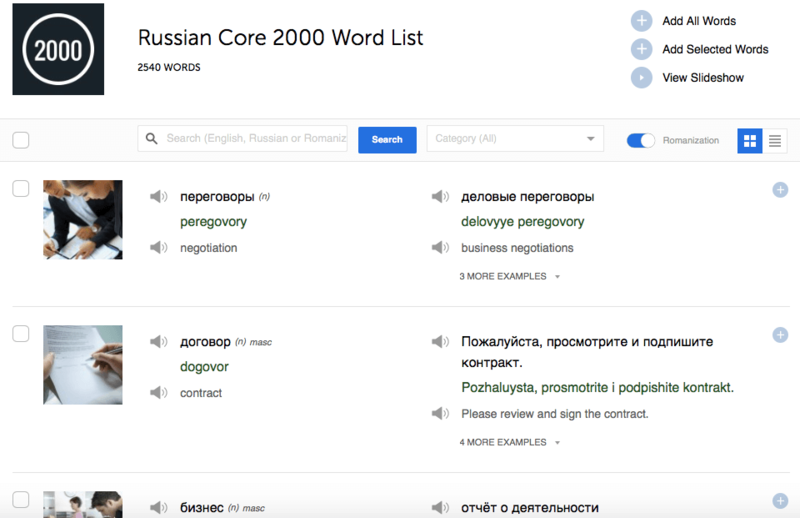 RussianPod101 has an incredible selection of thematic word lists that cover mundane topics like “the body” and “jobs”, to more esoteric things like “sounds that animals make” and “Star Wars terminology in Russian”. 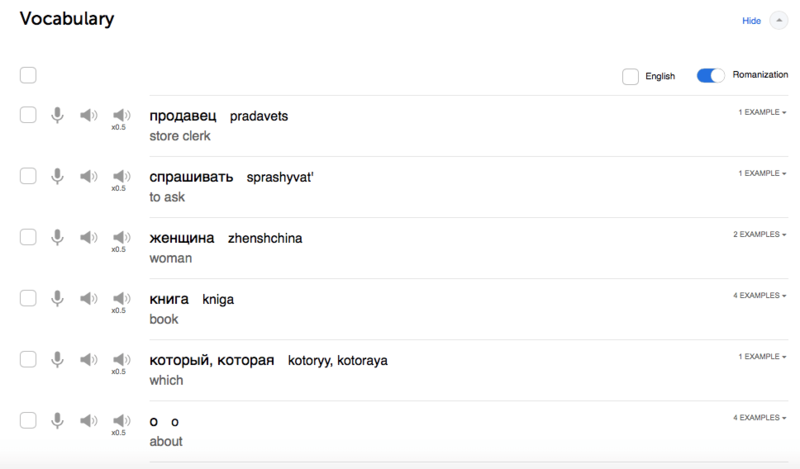 This is one of RussianPod101’s best features: the 2,000 most frequently used Russian words in order of usage. This is obviously a very useful way of making sure that there are no gaps in your vocabulary. If you take ten words each day and learn them off by heart you will find that your listening comprehension will improve incredibly rapidly. 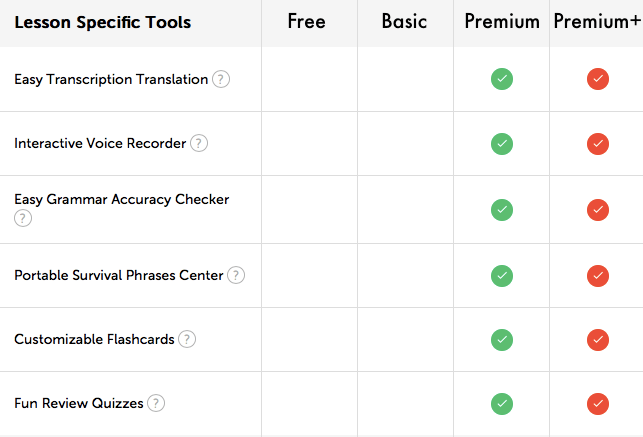 Each item comes with a translation, an example sentence, and an audio recording. Spaced repetition flashcards use algorithms to essentially ‘learn’ what words you have mastered and which ones you need to work on. They then show the latter words more frequently than the former ones, so you can make sure that you’re being tested on things that you find difficult. 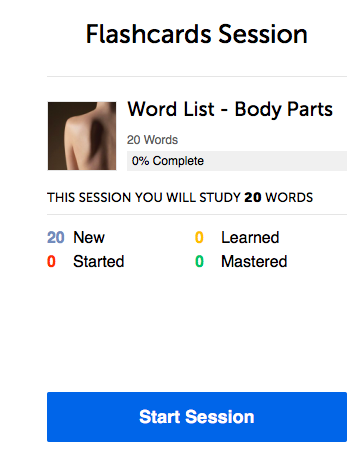 This is a nice addition to the program as you are able to add words from any part of the website (lessons, vocabulary lists, most common words) to your personal flashcard groups. 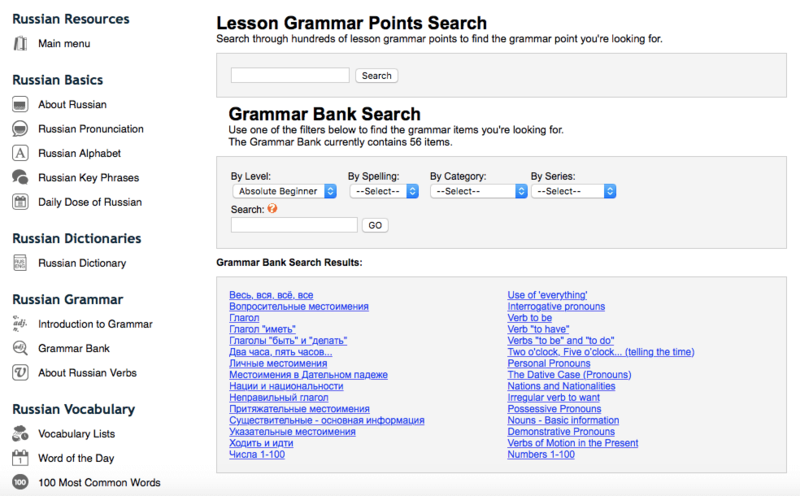 A standard searchable online dictionary. 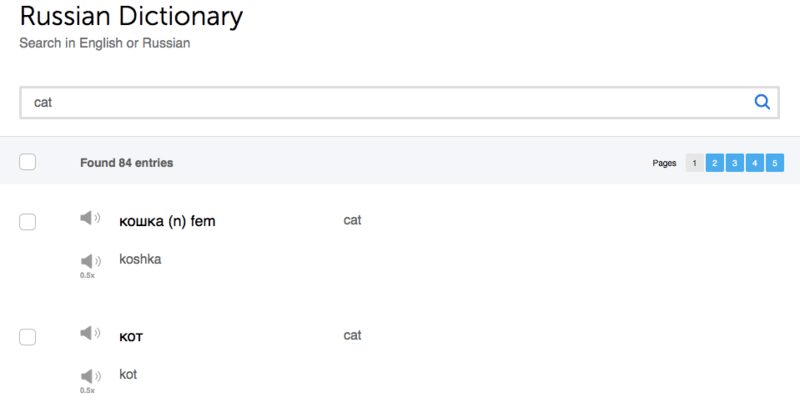 Nothing particularly special, but it does have a pronunciation audio sample (which can also be slowed down by half) for every word and term which is something you won’t find with the majority of other online dictionaries. Useful for checking your pronunciation against a native’s. 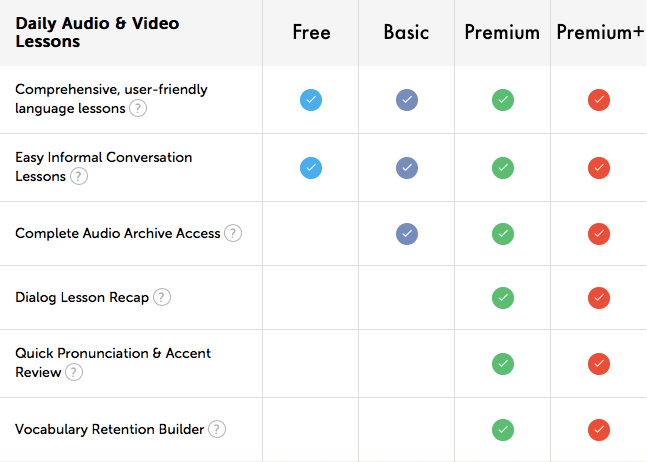 Purchasing a Premium+ package gives you access to RussianPod101’s ‘1-On-1 Learning’ feature. As soon as you have signed up for this option you are assigned a professional teacher who will henceforth play an active role in your Russian-learning activities. You start by filling in a detailed assessment test which gives your teacher a feel for your strengths and weaknesses, as well as your general proficiency level. They will then create a bespoke learning program that takes into account the goals that you want to achieve and the timeframe you want this into. If you are new to learning languages and want to follow a more structured approach with the guidance of a professional teacher, then we highly recommend that you choose a Premium+ package. Previous learners have stated that the 1-on-1 system not only helped them to develop effective learning strategies, but also gave them a massive confidence boost. 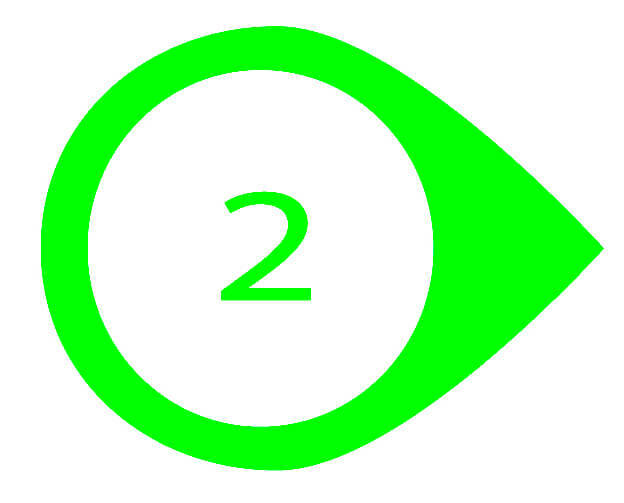 Your teacher will track your progress with regular assessments and will alter your learning plan as required. In addition, you are able to ask them an unlimited amount of questions related to Russian and they will private message you their answer as soon as they are able to. Regular homework assignments with answers and corrections (can be for whichever skill you require: reading, listening, grammar, etc.) are an excellent way of keeping you on track. You should note that everything here is done entirely according to your schedule – if you are too busy one week then you can hold off; if you want extra work the next, that won’t be a problem. CEFR-based certificates of achievements are awarded as you reach certain milestones in your program. As well as quantifying the progress that you have made, they are useful for putting on your CV and proving to potential employers that you can speak Russian. 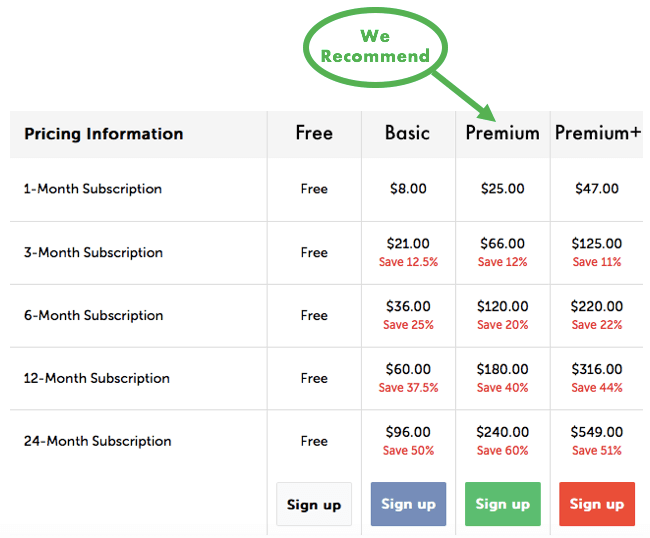 If you think that you would benefit from 1-on-1 Learning then click on the button below to get 20% off your Premium+ subscription! 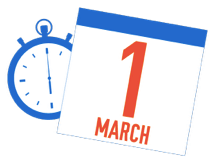 Once you create an account you are given the (one-time!) choice of experiencing the Premium plan for a month for just $1. We strongly recommend that you do this: it is the best way to see if RussianPod101 is the right product for you without committing yourself. Obviously, the right package for you depends on your budget and what you intend to use RussianPod101 for. That said, we believe that for most people the best option is the Premium package. This is because it gives you all of the tools and materials analysed above (minus 1-on-1 Learning) for a very reasonable price. You can often find some very generous discounts for RussianPod101 subscriptions. 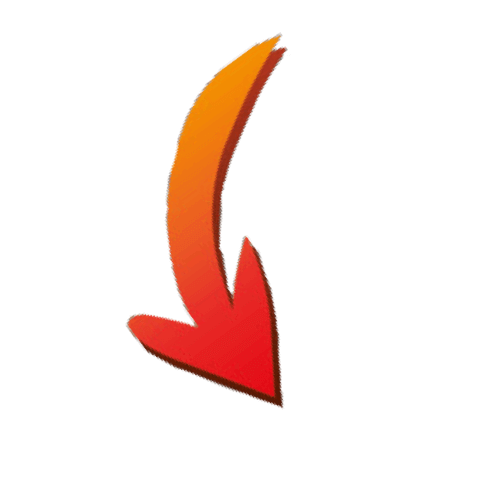 In this section we keep an updated list of the best offers available at the present time. To activate your coupon, simply click on the deal you’d like to take advantage of and you’ll be taken to the discounted RussianPod101 Plan Picker! Summary: RussianPod101 is an effective way for beginner and intermediate learners to quickly improve their listening skills. The wide range of topics covered and the increasingly challenging language will keep members engaged for a good couple of years. We would like to see more audio and video lessons for advanced learners, as we feel that this is the product's only real weak point. 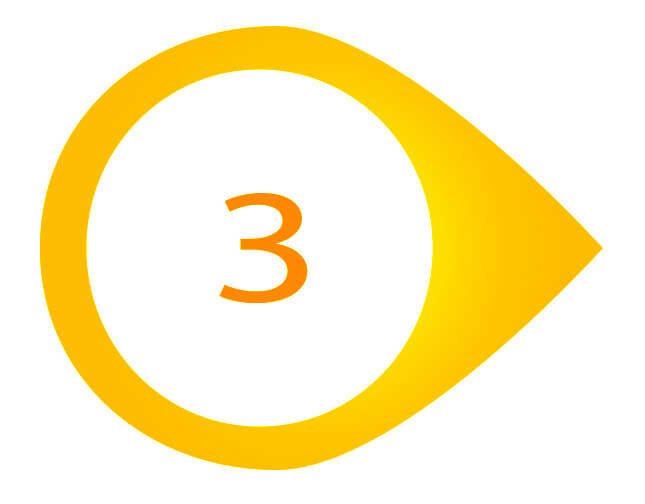 That said, we have been informed by a company spokesperson that they intend to massively expand this area of the website in the near future. 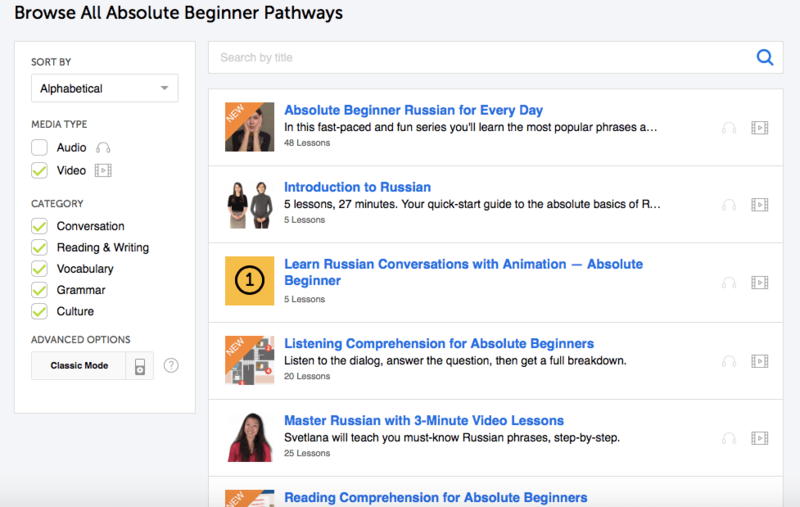 Features like the thematic word lists, downloadable lesson plans, and weekly homework assignments mean that members can use RussianPod101 as a Russian-learning 'nerve center' - it has tools and resources that allow you to perfect all of your language skills. In this sense, it is the perfect to an in-depth textbook. 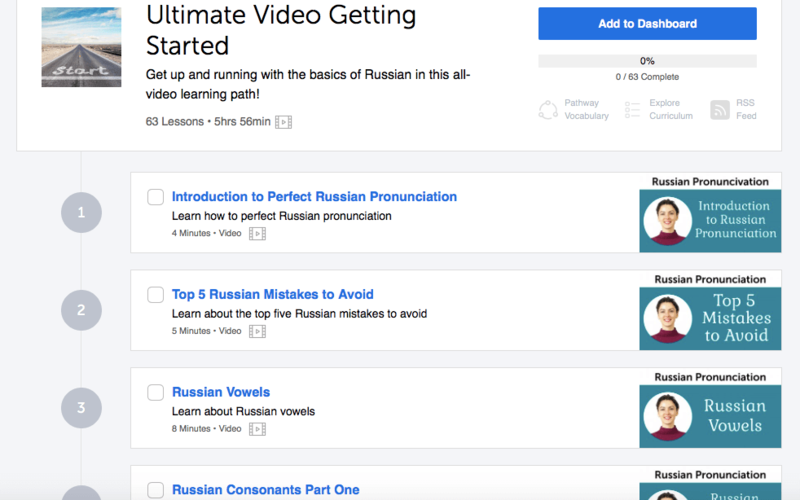 All of this, combined with the fact that there are subscription packages to suit all budgets, gives us the confidence to wholeheartedly recommend RussianPod101 to anyone looking to improve their Russian. If you would like to sign up for a free account and give it try, click on the link below!